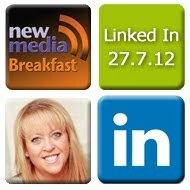 At this breakfast, you will find out how to maximise the effectiveness of how you use LinkedIn to enhance both your company's brand and gain the most benefit personally. Belinda is the Founder of WeDO Scotland, one of Scotland's most exclusive networking organisations for entrepreneurs and The Networking Coach which provides coaching in on and offline networking and LinkedIn. She has over 17 years experience in training and coaching in soft skills, sales and management and sold her first training company 12 years ago. She is an avid networker and user of LinkedIn as can be seen by her number of connections which exceed 1300, despite not adding the numerous unknown 'friend' requests she receives on a daily basis! Belinda is launching a new company this Autumn which will be the provider of global online soft skills training solutions underpinned by a state-of-the-art digital library and learning platform technology including social networking, assessment and remediation. You can view Belinda's public LinkedIn profile here.